Hollyburn Properties is committed to corporate social responsibility. As a property management company, we achieve this by developing lasting partnerships with local and national community organizations, creating innovative in-house programs and initiatives, activating at grassroots events, and by providing opportunities for our 10,000 residents across Canada to participate in our causes. Curious what we’ve got going on for 2016? 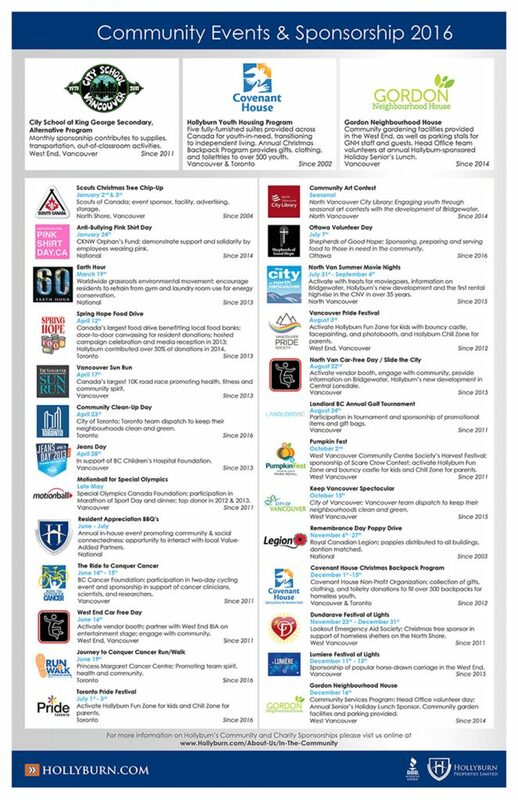 Check out Hollyburn Properties’ Community Sponsorships and Events calendar for this year, available for download below. In addition to this list, we have been running an ongoing Community Art Contest, in partnership with the North Vancouver City Library, to involve youth with the development of Bridgewater – the neighbourhood’s first new rental high-rise in over 35 years! Check out the winning artwork here! Have a program or idea you’d like to pitch us on? E-mail [email protected].